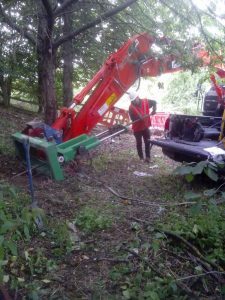 Our highly versatile excavator-mounted inclined rig solved the challenge of testing next to a road in Oxfordshire this summer. UK21 carried out 35 CPTs, to a maximum depth of 25m, at the proposed locations of drainage culverts for the road, at angles of between 20° and 55°. UK21 fits onto the end of most excavator arms and can be tilted to allow CPTs to be carried out at any angle up to 90°.